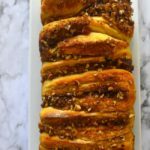 Apple walnut Pull Apart loaf is lightly sweet – perfect for laid back breakfast or to take along on a picnic. 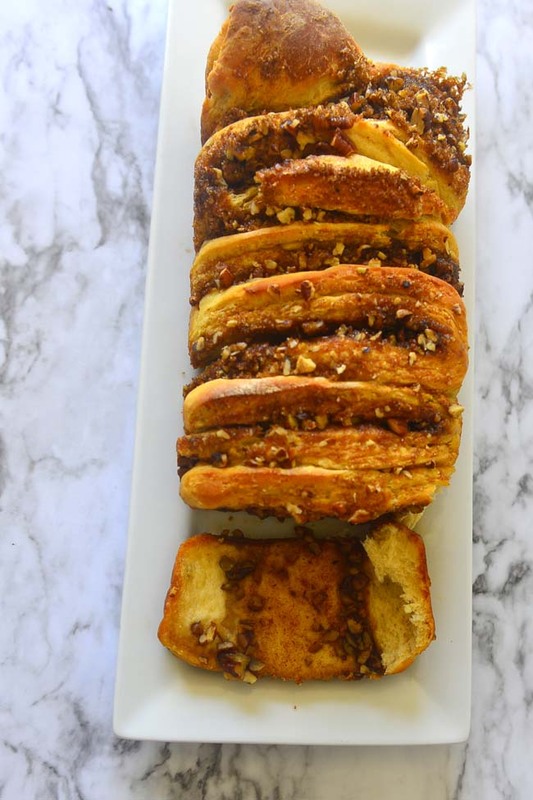 This is one way of capturing the fall flavors in a bread! The warm aromas fill the house as it bakes and it is a good thing that one does not have to wait for it cool to room temperature to dig in ! Warm is the way to go 🙂 . Pull apart breads come in all flavors , ready for breakfast , lunch, dinner or any time in between . These are meant to be shared , no slicing required. Honestly this is one bread that tastes heavenly when warm , don’t bother with cooling racks and such. Get it out off the oven , cook in the pan for a few minutes and onto the table it is ! 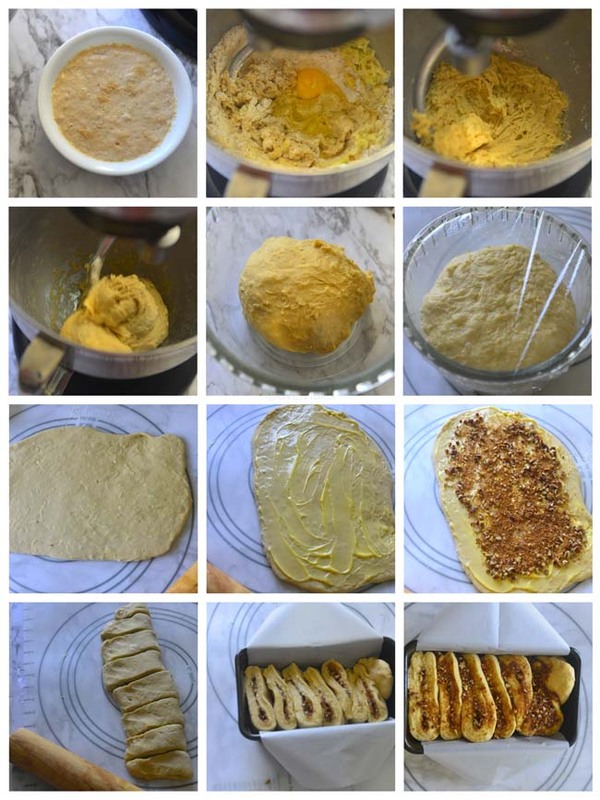 If your neighborhood stores sell bread dough – this is quite easy to make ! Now I prefer home mad e dough – so much better . 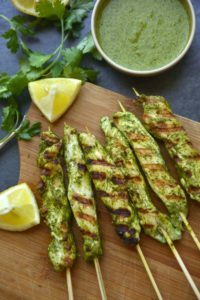 You can make this as 50 % whole wheat and lean , but still very light and delicious. This is a little wet dough. Not too wet, just a little stickier than the usual bread dough. I add the grated apples to the dough , and that adds to the moisture content of the dough. If it turns out to be too wet increase the flour . 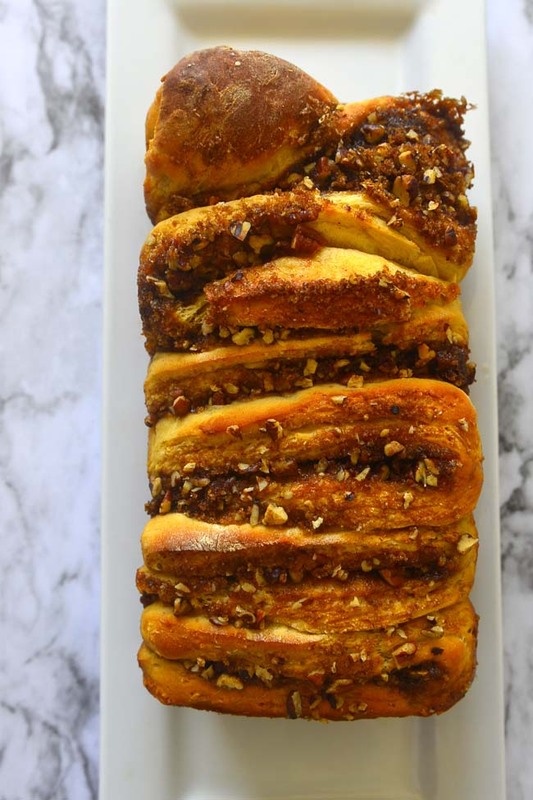 Pull apart breads are fun to make and a hit every time we make it. Often times I make a double batch of the dough and make a plain loaf and one with the fillings. The plain loaf is a little tart and very soft and spongy. You can definitely get a hint of apple. There is no set rule to how thick or thin the sections have to be. The ones in the picture above are fairly thick , as I was going for filling sandwiched sections. To get a better oven spring try the following method . About 10 minutes before baking place a sheet pan in the lower rack and preheat the oven to 400°F (200 °C) . To bake place the loaf pan in the middle rack and place a few ice cubes in the sheet pan . Close the oven door and reduce heat to 375 °F (190°C) and bake for 10 minutes . Reduce the heat to 350 °F (175 °C) and bake for 20 to 25 more minutes until done . If there is brown sugar sprinkled on top, you might want to cove the top of the bread with an aluminium foil to prevent over browning during the last 10 minutes or so of baking . 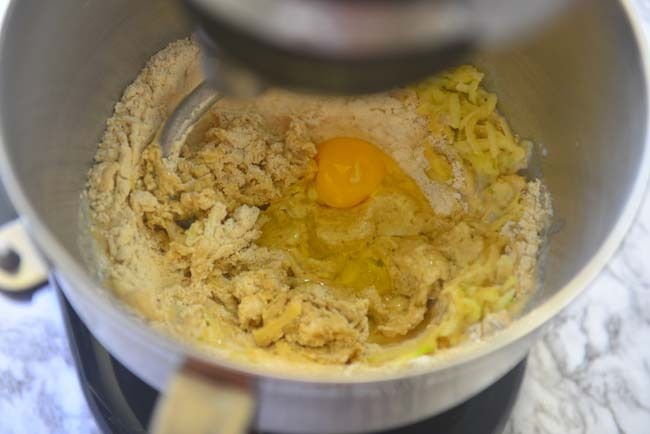 This recipe can be made without using the egg , I would recommend substituting the egg with 2 tablespoons of butter / oil and and adding few extra tablespoons of liquid during kneading . To make a vegan version follow the egg substitution above and replace milk with water / almond milk . This recipe makes a lightly sweet loaf . Increase the sugar to your taste . For added sweetness finish with a simple glaze . 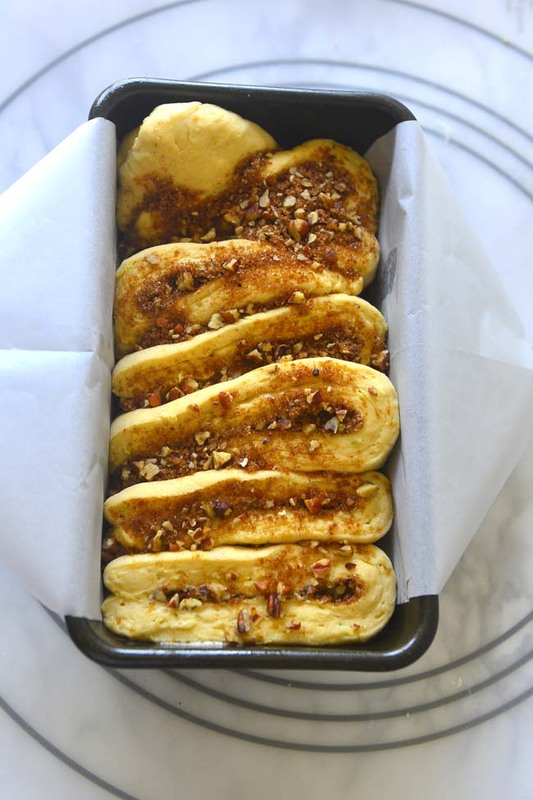 Here is the recipe for apple walnut pull apart bread. Heat milk/water until it is just warm (100 - 100 F). Take 1/4 C water and dissolve 1 tbsp sugar in it . Sprinkle the yeast on top and set aside for 5 to 10 minutes until the yeast become bubbly . Mix the 1 1/2 ap flour, ww flour , sugar and salt in a large bowl . 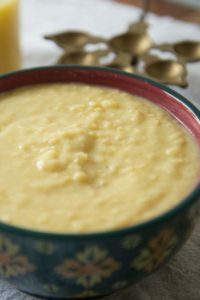 Coarsely grate the apple .Make a well at the center of the flour mix , and add the yeast mixture , followed by the egg , grated apples and the activated yeast mix. Knead to form a soft dough adding the remaining liquid , one tablespoon at a time. If using a machine knead for up to 4 minutes using the dough hook . If the dough seems very tacky add the add the remaining flour. Follow t he same process if kneading by hand. Once the dough has come together it takes about 10 minutes of kneading by hand. Add the remaining flour if needed. Oil a medium bowl and transfer the dough ball into it .Turn the dough so that all sides are evenly coated in oil . Cover with a wet kitchen towel or plastic wrap and let rise in a warm place till doubled - about 1 hour . Chop the walnuts coarsely . Soften 3 tablespoons of unsalted butter . Mix the brown sugar and cinnamon well . Coat the insides of a 9 X 5 loaf pan with butter. Punch down the dough .Lightly flour a kneading surface . Roll out the dough into 10 X 12 rectangle . Spread the softened butter on the dough rectangle. Sprinkle the cinnamon sugar and the chopped walnuts on top. Cut the dough into two 5X 12 rectangles (notes). Cut each rectangle into 4 equal pieces. Fold each piece along the middle and brush the tops with butter . Arrange the pieces side by side in the loaf pan with the ends facing up . If there is any leftover filling , sprinkle it on the top .Cover with a plastic wrap and let rise on a warm place till almost doubled , about 30 to 45 minutes . Preheat the oven to 350 °F (175 °C) and bake for 30 to 40 minutes until done (Refer to notes). Cool in the pan for 5 minutes . Transfer to a wire rack and cool completely . Whisk together powdered sugar , milk and vanilla for glaze . Drizzle over the cooled bread . Use unbleached all purpose flour preferable organic. The amount of moisture that flour can absorb varies as well as the amount of moisture in the apple. Add more flour to the dough as needed. The shaping instruction are for the pan size used . Tailor it to the number of sections wanted and the pan size used. The shaped dough can be covered and kept in the fridge for overnight rise. Take out and set out on the counter while the oven is preheating. Bake as usual ! Signup below ⇓ if you haven’t already !!! I promise NO SPAM ! Originally published in Dec , 2015. I love the flavors in the dough. 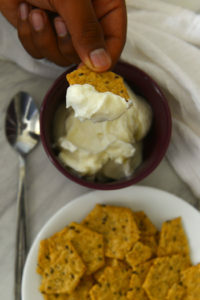 Can i make this with only whole wheat flour ? Yes, of course. Follow the same process as in the recipe. With just WW flour the dough will not be as wet and you may be able to add a 2 to 3 table spoons of extra water.